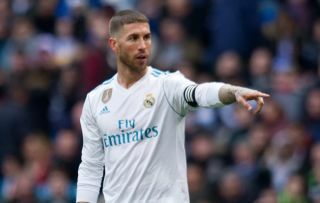 Real Madrid captain Sergio Ramos was reportedly not in favour of Julen Lopetegui’s touted decision to potentially play Vinicius Jr against Athletic Bilbao on Saturday night. As noted by Marca, the Brazilian starlet has seemingly made his case to be considered for inclusion after impressing since arriving in the Spanish capital. Bilbao away is never an easy task though, and so it seems like a fair touted assessment from Sergio Ramos with Don Balon claiming that the centre-half thinks that it would be a mistake to hand Vinicius his debut in such a difficult fixture. Instead, he is said to believe that it would be better if Lopetegui waited until the home clash with Espanyol to give the 18-year-old a chance to impress, and it appears as though his coach has eventually agreed with him as Vinicius was not included in the match day squad, as seen in the tweet below. As noted by BBC Sport, Los Blancos splashed out £38.7m on the teenager after presenting him as their new signing this past summer, and so he’ll have big expectations moving forward that he can make a positive impact at the Bernabeu. Given his inexperience and the lack of time he has had to fully settle though, there doesn’t appear to be a major rush to push him into action at senior level, despite the fact that he has been impressing for the Castilla side. Lopetegui has opted not to take that touted gamble this time round, and so it remains to be seen when Vinicius is given an opportunity to shine in a less pressurised environment.